Death holds a lot of unknowns for the average person at the best of times, but perhaps it could be said that this is doubly so for many Gaelic Polytheists, since it’s not something that is talked about much. Here I’ll be trying to cover the practises and traditional beliefs in Ireland and Scotland from the Iron Age (which roughly corresponds with the arrival of Celtic culture) to the present. This means starting with the archaeology to see how the dead were treated in the earliest Celtic period, before we have any written records, and then working our way along to the evidence found in the early medieval sources, and then later folklore and customs that have been recorded in more recent times. See also: Afterlife and Ancestors. There are a few difficulties in looking at the archaeological evidence for death and burial in the Iron Age of Ireland and Scotland, and this is primarily due to the fact that it is notoriously difficult to identify burials with any degree certainty to this date. As a result, most of what has been written about the subject is spotty, at best. This can limit us somewhat in the interpretations we can make based on the evidence before us. In addition to this, archaeology can’t tell us much about the specifics of ritual – not the words or actions that may have accompanied the actual act of laying the dead to rest, at least. But it does give us clues about the attitudes of the people who had to say goodbye to their loved ones, and hints about their beliefs as to the afterlife. From this we might only be able to speak in generalisations, but we can, perhaps, get something of a firmer idea if we consider the bigger picture and look to folk survivals in belief and practice, along with the historical sources that we have to hand. Again, the picture isn’t perfect, but it’s the only one we have. 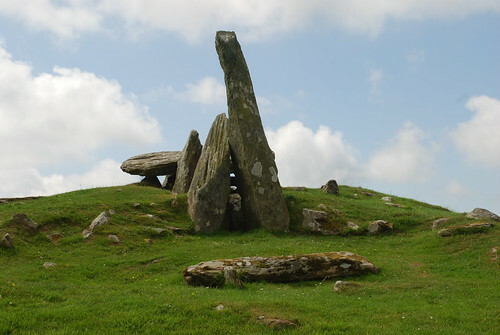 Prehistoric Ireland and Scotland (and Britain and Ireland as a whole) are covered in burial monuments, some huge and impressive, some of a more modest scale. These monuments, like Newgrange or Knowth in Ireland, or Cairn Holy, Cairnpapple, and Maes Howe in Scotland, cannot be considered to be Celtic because they were built prior to Celtic culture arriving. They vary in size, shape, and complexity, with specific styles of tomb being local to particular areas, but they are all monuments of the dead, committing them to the landscape and the memories of those who came after them. Into the Iron Age in Ireland, many of these monuments were still being used for burials, albeit occasionally. In most cases, cremated remains were left in pits dug into the mounds and then covered over,2 suggesting that although the culture and beliefs had changed (or were changing), they considered themselves to have a consistency and continuity with the people who had built the mounds before them. The story is quite similar in Scotland, with cremations covered by simple cairns or mounds being the earliest examples from the Iron Age, followed by burials becoming more popular over time. These burials were either singular, or multiple burials in one grave, on their own or sometimes in a cemetery (cemeteries probably developing later in the Iron Age, under Roman influence).113 Some burials have been found in apparently disused houses or settlements, whereas other deposits found in houses seem to have been put there as foundation burials14 – a way of keeping particular ancestors around for blessing or protective purposes, perhaps. Again, the type of burial changed over time. Earlier burials appear to have favoured a crouched position, whereas later burials (from around the time of ‘Roman Britain’), favoured long-cists, where the bodies were laid out flat on their back (hence the name ‘long-cist’, because they were longer than those that had crouched burials.15 These long-cist burials are particularly prevalent in the south-east of Scotland traditionally associated with the Pictish heartland, and it is thought that these types of burials are evidence of the earliest Christian burials in the area because they tend to occur in areas where the Pictish monuments show Christian iconography as well.16 In Pictish areas of Scotland, burials were covered over with circular or square mounds of earth or stones (depending on the type of material that was available, and/or the season – digging frozen ground would have been a tall order if stones were freely available), which were often marked out by ‘interrupted ditches’ – ditches around the edge of the mound that didn’t all meet up.17 Round mounds tend to be the favoured shape elsewhere for this period, in Ireland, for example (see above), but square mounds have also been found in Scandinavia and Yorkshire, Wales, and France.18 There is evidence from several of these mounds that carved Pictish stones were placed on top of the mounds, presumably to commemorate the deceased. The few burials of this type that have been excavated tend to date from around the 400s to 700s,19 right when there was a huge amount of change going on in Britain as a whole – the adoption of Christianity, the Anglo-Saxons settling further south, and the collapse of the Roman Empire. Although the Picts remained relatively unscathed from all of this upheaval and appear to have been relatively slower in adopting Christianity compared to the west of Scotland, clearly they weren’t as isolated or immune from such change as many have assumed in the past. Caves were also used for depositing bodies,20 and as in Ireland, some prehistoric burial mounds were reused. 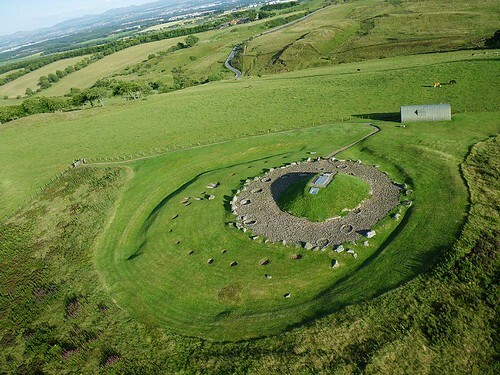 Cairnpapple Hill, for example, was originally a neolithic stone circle that was later turned into a burial site after it fell out of use for its initial purpose. At the centre of a circle in a mound with a stone burial cist and around the site are several burial pits. Evidence of the site being used for burial into the first millennium C.E. – well into the Christian period.21 Again, there is a sense of connection with the ancestors, and ancestral customs. In some cases, remains show evidence of a process known as excarnation, or ‘defleshing’, a practice that has been found in the neolithic period in Scotland as well. This is where a body is left out in the open for a period of time until the flesh and organs had been entirely eaten by birds, leaving the bones clean. The body is thought to have been placed on a wooden platform of some sort, probably in a fairly remote area where it would have been left alone by people and predators alike. The bones were then taken and used in a variety of different ways, sometimes with the larger bones being buried at various points around a house, while the smaller bones – more difficult to spot, perhaps, or deliberately placed – often ended up in the midden (rubbish/garbage piles). 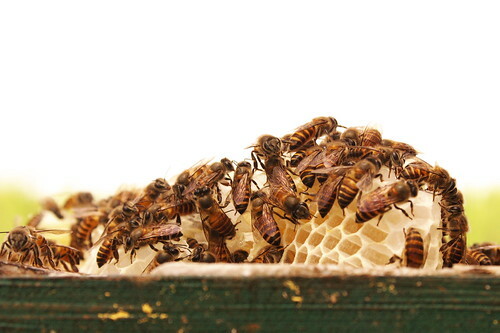 In some cases, the bones may even have been kept around before being buried. It is clear, however, that excarnation was just one way of treating the dead, and while cremation could arguably serve the same purpose of releasing the spirit quickly, there is something of a contradiction when considering the cist burials. Why some people were treated differently compared to others is impossible to say, although it is reasonable to assume that beliefs and preferences between people and localities were not necessarily uniform, just like today. There is a remarkable consistency in the surviving folklore between Irish and Scottish traditions associated with death and burial, but also, there are some subtle nuances that make it worth examining both areas separately, so that they may be appreciated. One of the biggest reasons for these differences is the change of the religious climate in Scotland, which resulted in the clamping down on many perceived moral abuses that were seen at the time. The Church in Ireland had similar concerns over the centuries, but efforts to clamp down on such immoralities were far less successful. This allowed many of the traditions associated with such an important rite of passage to survive for far longer than it would have otherwise. Firstly, there was the preparation of the body – washing it, dressing it, and laying it out. Then there was the wake, where the body was watched over constantly by friends and family, until it was time for the funeral. The waking period gave time for distant relatives to travel for the funeral, and also gave the opportunity to for friends and family to say goodbye. When it was time for the funeral, there was a large procession to the Church, where the final rites were given, and the body laid to rest. Throughout it all, there were family, friends and neighbours present. Death was not a private, family affair, but the focus of the whole community, who saw to it that the deceased was treated properly and had a proper send-off. Everyone took part; the burden of grief was shared. When the time came for the funeral, the mourners gathered again, and at this point there were further displays of grief. Tears flowed freely, and cries and laments filled the room, the name of the deceased was called upon.70 After a while, the relatives would be taken out of the room, and the body would be put in the coffin, and sometimes small items were placed in the coffin too – a little money, food, clothes, holy water, and so on.71 which was usually set on some chairs. These chairs were shaken in all directions before the coffin was lifted off and taken on its way, and the mourners would often carry salt in their pockets for the journey, to ward off the ‘other people’72 – spirits of the departed, perhaps, or the Good Folk. Or both. While everyone gathered waited for the procession to begin, athletic games were often engaged in – hurdling, jumping, and wrestling in particular,73 recalling the funeral games held in honour of Tailtiu at Lùnastal, for example. While much the same can be said for Scotland as it can for Ireland, in terms of its approach to death and burial, there are many differences as well. On the one hand, these differences may be seen as local variations, but outside influences, and in particular, difference in the religious climate (i.e. the influence of the Kirk in Protestant areas of Scotland) can’t be discounted.83 The sources we have also tend to emphasise the perceived dangers surrounding the recently deceased as well, although in Irish sources this fact is usually implicit, if not openly discussed. Upon their arrival, mourners were given a hot toddy, which were then drained to the memory of the deceased, and bread and cheese passed around. Another toddy followed, with the toast – “Consolation to the friends of the deceased,”92 then more bread and cheese, and more toddy or ale was offered. Eventually, the time came to go and see the body so that formal respects could be paid. In Napier’s youth of the early-mid nineteenth century, it was the duty of the local youths to stay up with the deceased, and unlike the unseemly antics of past traditions, Napier maintains that the evening was spent in a far more refined and dignified fashion befitting the treatment of the dead, as opposed to the dancing and drinking of previous centuries. Although it didn’t stop some young couples sneaking out for the chance of some flirting and even love-making… Instead, stories were told or read out loud – especially ghost stories – with the occasional refreshments of a glass of whisky, and tea and bread.101 Gregor describes a similar scene, with turns taken to read from the Bible, and conversations whispered in hushed tones. In some instances, however, there were the sort of pranks played that are typical of Irish wakes – somebody surreptitiously making the body move, or seem like the dead person is talking – but the general atmosphere was far more subdued.102 John Firth of Orkney mentions some games, especially card-games being played,103 but for the most part Scottish sources are keen to show a more dignified approach to wakes than their Irish counterparts. From the earliest archaeological evidence of the Celts in Scotland and Ireland we see a varied practice, with underlying similarities. There is a sense of continuity with the past, and even though huge cultural changes were under way at the time, the fact that the dead were sometimes laid to rest in older burial monuments reinforces the idea. We might see this as a belief in returning the dead to the ancestors, who were integral to the landscape. 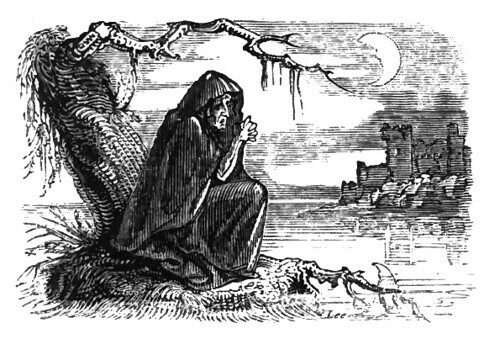 Similarly, the belief in the bean-sí as a foreshadowing of death – sometimes a shadowy figure with no name, sometimes known as the Badb, Áine, Bó Find, the Bean-nighe – who take on the role of death-messenger can all be seen to be both goddesses and ancestors; they come to claim their own, and in some cases, these messengers can be seen to haunt certain areas. The wake can therefore be seen as something of a liminal period between living and dying – a transitionary period where both the living and the dead accommodated each other. The fact that many of the games and amusements, the refreshments and entertainment, can be found at many other festival occasions122 further blurs the lines between the two, bringing an element of normalcy during a period of great change. To many, as much as the wake provided a catharsis to the mourners, wakes and funerals were merrier occasions than weddings; the ultimate festive occasion. 1 Mummification in Bronze Age Britain. 2 Raftery, ‘Iron-age Ireland’, A New History of Ireland Volume I: Prehistoric and Early Ireland, Ó Cróinín (Ed. ), 2005, p171. 3 Raftery, Pagan Celtic Ireland, 1994, p189; Duffy, Medieval Ireland, An Encyclopedia, 2005, p388. 4 Duffy, Medieval Ireland, An Encyclopedia, 2005, p388. 5 Raftery, ‘Iron-age Ireland’, A New History of Ireland Volume I: Prehistoric and Early Ireland, Ó Cróinín (Ed. ), 2005, p171. 6 Cunliffe, Iron Age Communities in Britain, 1975, p287; Raftery, ‘Iron-age Ireland’, A New History of Ireland Volume I: Prehistoric and Early Ireland, Ó Cróinín (Ed. ), 2005, p171. 7 Cunliffe, Iron Age Communities in Britain, 1975, p291. 8 ‘kist’ – pronounced with a hard ‘c‘. 9 Raftery, ‘Iron-age Ireland’, A New History of Ireland Volume I: Prehistoric and Early Ireland, Ó Cróinín (Ed. ), 2005, p173. 10 Duffy, Medieval Ireland, An Encyclopedia, 2005, p53. 11 Mallory, ‘The World of Cú Chulainn: The Archaeology of the Táin Bó Cúailnge’ in Mallory (Ed), Aspects of the Táin, 1992, p129. 12 Mallory, ‘The World of Cú Chulainn: The Archaeology of the Táin Bó Cúailnge’ in Mallory (Ed), Aspects of the Táin, 1992, p129. 13 Hingley, Settlement and Sacrifice, 1998, p53; Carver, Surviving in Symbols, 1999, p22-23. 14 Hingley, Settlement and Sacrifice, 1998, p53. 15 Carver, Surviving in Symbols, 1999, p23; See also, Raftery, ‘Iron-age Ireland’, A New History of Ireland Volume I: Prehistoric and Early Ireland, Ó Cróinín (Ed. ), 2005, p173. 16 Carver, Surviving in Symbols, 1999, p22-23. Pictish monuments are generally split into two classes – Class I and Class II. Class I types are usually found on stones, slabs or boulders, and only show symbols of stylised animals or abstract artwork. 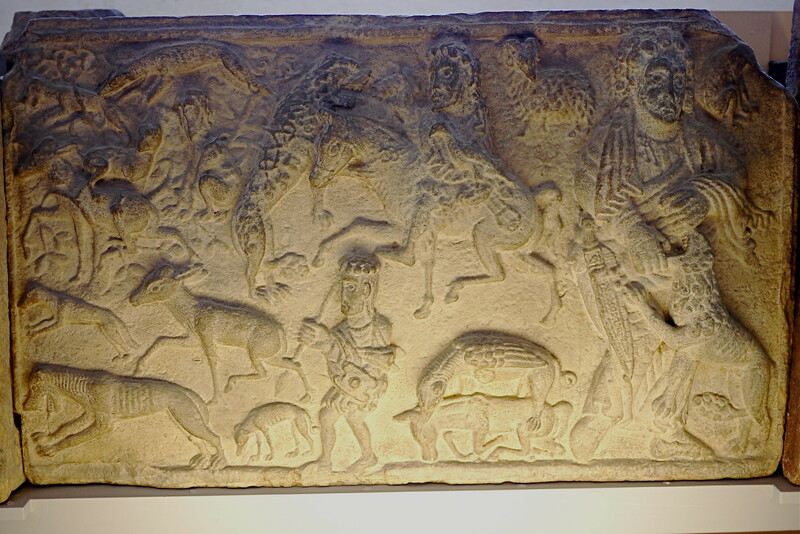 Class II types are usually upright slabs, deliberately set in place and carved with both symbols, Christian imagery, and scenes of people hunting, at war, or acting out stories from the Bible. Class I monuments are thought to be earlier because they show no evidence of Christianity, suggesting they are pre-Christian in origin. See Carver, Surviving in Symbols, 1999, p19. 17 Carver, Surviving in Symbols, 1999, p24. 18 Carver, Surviving in Symbols, 1999, p24. 19 Carver, Surviving in Symbols, 1999, p24. 20 Hingley, Settlement and Sacrifice, 1998, p53. 21 Information panel at Cairnpapple hill. 22 Ritchie and Ritchie, Scotland: Archaeology and Early History, 1991, p98-99. 23 Hingley, Settlement and Sacrifice, 1998, p53. 24 MacKenzie, Scottish Folk-Lore and Folk Life, 1935, p286. 25 Shaw, Folk Songs and Folklore of South Uist, 1977, p9. 26 Black, The Gaelic Otherworld, 2005, p262. 27 Black, The Gaelic Otherworld, 2005, p239. 28 Shaw, Folk Songs and Folklore of South Uist, 1977, p9. 29 Black, The Gaelic Otherworld, 2005, p234-235. 30 Lysaght, Banshee: The Irish Supernatural Death-Messenger, 1986, p198. 31 Lysaght, Banshee: The Irish Supernatural Death-Messenger, 1986, p193-4. 32 Lysaght, Banshee: The Irish Supernatural Death-Messenger, 1986, p197. 33 Lysaght, Banshee: The Irish Supernatural Death-Messenger, 1986, p194-196; p205-206. In the case of the Fitzgeralds, their connection with Áine is arguably a way of legitimating their claim to land that has been usurped from Irish chiefs. 34 Fairweather, Highland Heritage, 1984, p37. 35 Ó Súilleabháin, Irish Folk Custom and Belief, 1967, p54. 36 Ó Súilleabháin, Irish Wake Amusements, 1967, p28. 37 Ó Súilleabháin, Irish Folk Custom and Belief, 1967, p51. 38 Ó Súilleabháin, Irish Folk Custom and Belief, 1967, p53. 39 Danaher, In Ireland Long Ago, 1962, p173-174; Ó Súilleabháin, Irish Folk Custom and Belief, 1967, p53. 40 Ó Súilleabháin, Irish Wake Amusements, 1967, p14. 41 Evans, Irish Folk Ways, 1957, p290; Danaher, In Ireland Long Ago, 1962, p173-174. 42 Ó Súilleabháin, Irish Wake Amusements, 1967, p10. 43 Danaher, In Ireland Long Ago, 1962, p173-174. 44 Ó Súilleabháin, Irish Folk Custom and Belief, 1967, p53-54. 45 Ó Súilleabháin, Irish Folk Custom and Belief, 1967, p53-54. 46 Ó Súilleabháin, Irish Wake Amusements, 1967, p67. 47 Ó Súilleabháin, Irish Wake Amusements, 1967, p10. 48 Ó Súilleabháin, Irish Wake Amusements, 1967, p31; p67. 49 Ó Súilleabháin, Irish Wake Amusements, 1967, p163. 50 Ó Súilleabháin, Irish Wake Amusements, 1967, p117-118. 51 Ó Súilleabháin, Irish Wake Amusements, 1967, p48. 52 Ó Súilleabháin, Irish Wake Amusements, 1967, p40. 53 Ó Súilleabháin, Irish Wake Amusements, 1967, p31-32. 54 Ó Súilleabháin, Irish Wake Amusements, 1967, p39. 55 Ó Súilleabháin, Irish Wake Amusements, 1967, p40. 56 Ó Súilleabháin, Irish Wake Amusements, 1967, p46. 57 Ó Súilleabháin, Irish Wake Amusements, 1967, p49. 58 Ó Súilleabháin, Irish Wake Amusements, 1967, p56. 59 Ó Súilleabháin, Irish Wake Amusements, 1967, p66. 60 Ó Súilleabháin, Irish Wake Amusements, 1967, p49. 61 Ó Súilleabháin, Irish Wake Amusements, 1967, p71. 62 Ó Súilleabháin, Irish Wake Amusements, 1967, p19. 63 Evans, Irish Folk Ways, 1957, p291. 64 Evans, Irish Folk Ways, 1957, p291. 65 Ó Súilleabháin, Irish Wake Amusements, 1967, p32. 66 Ó Súilleabháin, Irish Wake Amusements, 1967, p67. 67 Ó Súilleabháin, Irish Wake Amusements, 1967, p106. 68 Ó Súilleabháin, Irish Wake Amusements, 1967, p66. 69 Ó Súilleabháin, Irish Wake Amusements, 1967, p67. 70 Ó Súilleabháin, Irish Folk Custom and Belief, 1967, p130-131. 71 Ó Súilleabháin, Irish Folk Custom and Belief, 1967, p55. 72 Evans, Irish Folk Ways, 1957, p292. 73 Ó Súilleabháin, Irish Wake Amusements, 1967, p53. 74 Taylor, ‘Bás InÉirinn: Cultural Constructions of Death in Ireland,’ Anthropological Quarterly, Vol 62 No. 4 The Uses of Death in Europe, 1989, p180-181. 75 Lucas, Cattle in Ancient Ireland, 1989, p7-11. 76 Ó Súilleabháin, Irish Folk Custom and Belief, 1967, p137. 77 Ó Súilleabháin, Irish Folk Custom and Belief, 1967, p138; p157. 78 Evans, Irish Folk Ways, 1957, p292-293. 80 Ó Súilleabháin, Irish Custom and Belief, 1967, 57. 81 Danaher, In Ireland Long Ago, 1962, p174. 82 Evans, Irish Folk Ways, 1957, p292. 83 Ross, Folklore of the Scottish Highlands, 2000, p121. 84 Napier, Folk Lore, Or, Superstitious Beliefs in the West of Scotland Within this Century, 1879, p40. 85 Gregor, Notes on the Folk-Lore of the North of Scotland, 1881, p206. 86 Gregor, Notes on the Folk-Lore of the North of Scotland, 1881, p206. 87 From J. Maxwell Wood, Dumfries, 1911, in Bennett, Scottish Customs From the Cradle to the Grave, 1992, p230-31. 88 Napier, Folk Lore, Or, Superstitious Beliefs in the West of Scotland Within this Century, 1879, p41; Bennett, Scottish Customs From the Cradle to the Grave, 1992, p220. 89 Gregor, Notes on the Folk-Lore of the North of Scotland, 1881, p209. 90 Napier, Folk Lore, Or, Superstitious Beliefs in the West of Scotland Within this Century, 1879, p42. 91 Gregor, Notes on the Folk-Lore of the North of Scotland, 1881, p210-11. 92 Gregor, Notes on the Folk-Lore of the North of Scotland, 1881, p209. 93 Gregor, Notes on the Folk-Lore of the North of Scotland, 1881, p209. 94 Bennett, Scottish Customs From the Cradle to the Grave, 1992, p220. 95 From Lewis Grant, Strathspey, 1983, Bennett, Scottish Customs From the Cradle to the Grave, 1992, p271. 96 Grant, Highland Folk Ways, 1961, p368. 97 Napier, Folk Lore, Or, Superstitious Beliefs in the West of Scotland Within this Century, 1879, p42-43. 98 Gregor, Notes on the Folk-Lore of the North of Scotland, 1881, p209. 99 Fairweather, Highland Heritage, 1984, p49. 100 Grant, Highland Folk Ways, 1961, p368. 101 Napier, Folk Lore, Or, Superstitious Beliefs in the West of Scotland Within this Century, 1879, p41; p44. 102 Gregor, Notes on the Folk-Lore of the North of Scotland, 1881, p209. 103 From John Firth, Orkney, 1920, Bennett, Scottish Customs From the Cradle to the Grave, 1992, p273. 104 Gregor, Notes on the Folk-Lore of the North of Scotland, 1881, p209. 105 Napier, Folk Lore, Or, Superstitious Beliefs in the West of Scotland Within this Century, 1879, p43. 106 Gregor, Notes on the Folk-Lore of the North of Scotland, 1881, p212. 107 Gregor, Notes on the Folk-Lore of the North of Scotland, 1881, p211-12 Grant, Highland Folk Ways, 1961, p369. 108 Grant, Highland Folk Ways, 1961, p369; Fairweather, Highland Heritage, 1984, p49. 109 “an ainm Athar, an ainm Mic, an ainm Spioraid.” Carmichael, Carmina Gadelica Vol III, 1940, p370. 110 Newton, A Handbook of the Scottish Gaelic World, 2000, p161; Grant, Highland Folk Ways, 1961, p369. 111 Carmichael, Carmina Gadelica Vol II, 1900, p309. 112 Fairweather, Highland Heritage, 1984, p49. 113 From John Lane Buchanan, Western Isles, 1782, in Bennett, Scottish Customs From the Cradle to the Grave, 1992, p275-276. 114 From J. Maxwell Wood, Dumfries, 1911, in Bennett, Scottish Customs From the Cradle to the Grave, 1992, p233. 115 Grant, Highland Folk Ways, 1961, p367. 116 Gregor, Notes on the Folk-Lore of the North of Scotland, 1881, p213. 117 Taylor, ‘Bás InÉirinn: Cultural Constructions of Death in Ireland,’ Anthropological Quarterly, Vol 62 No. 4 The Uses of Death in Europe, 1989, p179-181. 118 Bennett, Scottish Customs From the Cradle to the Grave, 1992, p232; Ó Súilleabháin, Irish Wake Amusements, 1967, p23. 119 Ó Súilleabháin, Irish Wake Amusements, 1967, p165. 120 Ó Súilleabháin, Irish Wake Amusements, 1967, p171. 121 See Ettlinger, ‘The Association of Burials with Popular Assemblies, Fairs and Races in Ancient Ireland’ in Études Celtiques Vol 6, 1953, p30-61. 122 Ó Súilleabháin, Irish Wake Amusements, 1967, p162.